2012 saw me studying with the School of Social Entrepreneurs in Sydney and culminating on Wednesday 21.11.12 being awarded Social Entrepreneur of the Year 2012. This incredible opportunity enabled me to ‘sharpen’ the business of making change happen with ‘Mela-What?’ and ride4acure. Am thrilled to the core to have been voted Entrepreneur of the Year 2012 and want to encourage people to ‘make change happen’. Looking back over the last three years with ride4acure and Mela-What? i’d never dreamed so much could be have achieved when I began pedaling in 2009. Thank you to all those who’ve been ‘shoulder to shoulder’ with me on this journey from the bottom of my heart. Thank you to all the people who’ve ‘heard’ and taken steps in their own lives and the lives of their families to change habits and help educate others to take care of the skin their in. Three years ago I set a goal to ‘put melanoma on the map‘ after Hannah’s death at 20. Over that three years I’ve spoken with over 22 000 young Australians as I’ve shared ‘Mela-What?’ the multimedia presentation across the country. The plans created to do this shift and change but my eyes always firmly on the goal (love that quote). Throughout 2010 and 2011 on the two horse treks, schools across the country asked if I had an online resource young people and communities could access. I didn’t then butl I can say now I DO!! Mela-What? online is just about complete and watch this space for details of launch and roll out. This project was possible because so many good people have contributed. Firstly the incredible people I’ve met who put their hands up to share stories of their own journeys with melanoma, families of young people who’ve lost their precious lives to melanoma, and friends of Hannah’s who’ve shared their story of losing a mate and their learning about melanoma from that. The production was made possible because of the NBN project EduOne (University New England UNE), New England TAFE and the Australian Government and of course Esther and Joe for their continuing support and contribution. I have attempted to write this post approximately ten times now, people who know me will know I have the gift of the gab so me being stuck for words is a very rare occasion. 12 months on from the trek, Han’s 24th birthday. I am lost for words. I mentioned to Mum about inspiration last night and it stuck with me. I think it appropriate to thank those who inspire me on this day. So firstly, I would like to write a paragraph for my Amazing Mum. Secondly, a MASSIVE HAPPY 24TH BIRTHDAY TO MY EQUALLY INCREDIBLE OLDER SISTER. I know you are not here to celebrate with us today Han but there will be many a glass raised in your name tonight. 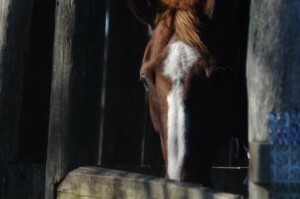 Not a day goes by without you in my thoughts and heart. 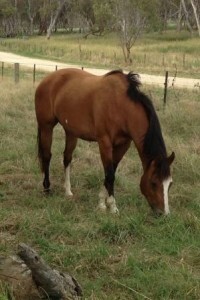 Thirdly, I have three horses, Titan, Meg and Surprise sitting in a feed lot paddock here in Glen Innes with me. They have covered every mile I have ever asked them without questioning, hesitating or complaining. I feel the greatest debt of gratitude towards these three. I am fortunate enough to be in a position where I can have my crew back together again. It means the world to me to be able to lay a hand on each of their foreheads this morning and remember the great Triumphs and the great cost of the Trek physically for myself and my horses . 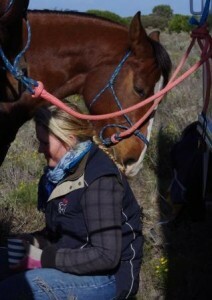 On this day 12months ago I embarked on a 4600+km journey with three horses, three dogs and My Mum and Brother Joe. I thank all of the people that made that possible, all of our sponsors, without them the 2011 Coast2Coast horsetrek would still be a dream for me. All of the people that helped bring my massive aspirations to reality, I thankyou from the bottom of my heart. 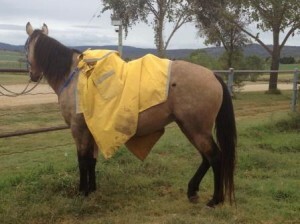 Meg at work at Rangers Valley Feedlot Glen Innes NSW Still loving and using our Muddy Creek Rain Gear! Sunday 25th March 2012 at Manly Beach from 9am. Australia has the highest incidence of melanoma in the world. Often called Australia’s national cancer, melanoma affects more Australians aged 15-44 than any other cancer. Take action against melanoma and be part of the cure – join us and March for Melanoma at Lagoon Park Queenscliff (Manly Beach) from 9am (registration and further information) The Melanoma March is proudly supporting the Melanoma Institute Australia(the old Sydney Melanoma Unit in North Sydney where our journey with Hannah and Melanoma started Christmas 2007). Gathered with other melanoma warriors, Melbourne March for Melanoma 2011. Last year we travelled to Melbourne to support MelaNoMore/Emily Tapp Foundation’s Louise White has been organising a march down there for 3 or so years, followed last year by Melanoma WA, Albury NSW, and now in 2012 the first Sydney March.. our dream is to have a National March coordinated around the country to remember those who’ve lost their lives and to support those living with melanoma and to inspire others to raise awareness and be pro-active in protecting themselves and their families/communities. Joe and I will be travelling to Sydney to walk in memory of our Hannah – hope to see you there! I have goals to develop ‘Mela-What?’ (the multi-media presentation I created early 2009 that has now been seen by over 22 000 people) and to launch it online as a resource for schools and communities to access. Stage 1 of ‘Mela-What? Online’ will hopefully be ready to go live next month. I have been working toward this throughout 2011 with the support of a NSW Cancer Council small grant, and the profession expertise of a multi-media company called TRaMS & SMaRT: Training Resource and Mult Media Studio Pty Ltd, It is only with the generosity of these donations that this project has been made possible. Other news is that Esther and I have both been inducted into the Long Riders Guild (an international equestrian association that acknowledges the efforts of horse riders undertaking continuous journey’s of over a thousand miles (1600kms +) anywhere in the world, Esther for her 4700km journey from East to West from Crescent Head NSW to Perth WA in 2011, and myself for my solo pack horse trek in 2010 from Willawarrin (30kms west Kempsey) to Melbourne VIC 1860kms. A pot of tea, my well worn note book, my well travelled Dell computer netbook are all in front of me while I sit on my back verandah and let my view drift to the stand of tallowood trees out in the horse paddock. Twelve short days time will mark 3 years since Hannah’s death from melanoma on 22nd December. Most of the time since then I’ve worked tirelessly to understand this disease that took Han’s young life. Discovering early in 2009 that melanoma wasn’t the one in a million disease i thought it was but rather the most prevalent cancer young people 15-25 years of age are diagnosed with in Australia. This put a fire in my belly to make a change. To help raise awareness of melanoma as a young persons disease and to raise funds to find a cure. Sitting on my verandah now i think not just back to this but to the future. 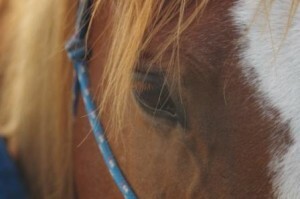 Toward 2012 and the year ahead for ride4acure and the Hannah Rose Melanoma Research Fund. I’m busy applying for grants to help produce more resources for ‘Mela-What?’ the multi media presentation that’s now been seen by over 22 000 young Australians across four states. I’m working to get an online version for schools to use as follow up and as a stand alone educational resource. 2012 will hopefully see me travelling to distant places to meet up with other educators who are ‘putting melanoma on the map’ in their areas. 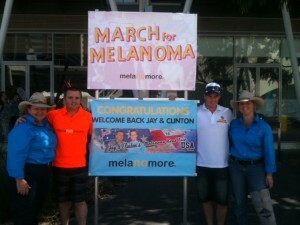 2012 will see me learning from them and developing further the campaign I’ve undertaken to promote skin cancer and melanoma awareness in every school in Australia. Roll on 2012. Every day is a blessing to me. The privilege of work, friends, home, a wonderful community to live in and raise my family a place like the Macleay Valley to simply Be. Everything is amplified for me as always looming in the backdrop is how quickly life can change and since losing Hannah I take nothing for granted. Every thing is a blessing and I am grateful. I recently was able to contribute to Life Matters on ABC Radio National’s Life Matters regarding charity choices. From this radio interview I’ve been presented with the opportunity to meet up with Professor Rick Kefford who is a leading Melanoma Researcher focusing on the role genetics have. I’m hoping to get to Sydney by the end of November and possibly line up with a visit to the gallery of NSW Parliament to be in the gallery when a community petition is tabled by the NSW Cancer Council to extend smoking bans in outdoor areas. 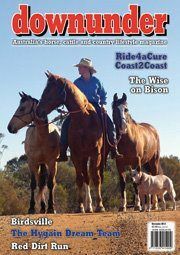 There’s also a feature article in the latest Horse Downunder magazine for the Coast2Coast Horse Trek – has a great picture of Esther, the three horses and her dog Bobby on the front cover. 6.9.2011 ~ Finished for a month? already? Wow, one month since the completion of my epic trek… and I must apologise for the delay in me writing a post.. I am a slacker and also didn’t want the adventure to end! On the way home I got sick in Balranald and had a quick trip to hospital, to make sure it was nothing to dramatic and had another check up yesterday. I am booked in to see a pyhsio as the doctors words were ‘she sits beautifully on a horse, but not so walking!’ Since I have been walking and standing on my own two feet after three months of Training then three months of trekking I have somewhat done a touch of damage to my natural posture. 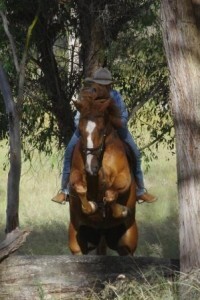 I can trot 30k’s on a horse no worries but if I walk a kilometre I am crippled the next day! Slightly concerning for a 21 yr old but nothing that isn’t fixable! This Photo is taken on the Nullarbor when I am trying to get out of the wind. 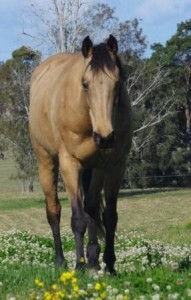 Lofty my forever cheeky companion. Meg, forever tough and enduring. Titan, my main man who through everything covered his miles made me furious, happy and most of all was comfortable!